Jamie planned yet another perfect vacation and photography destination trip for us this year (2018). 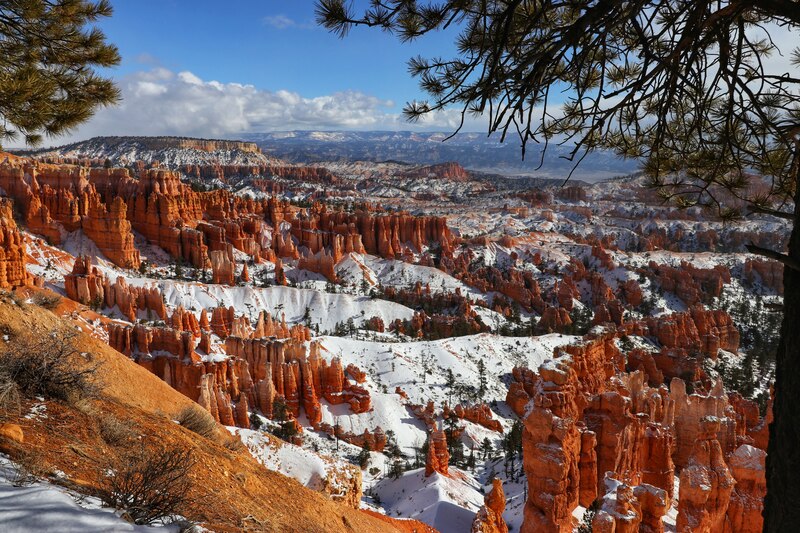 On the heels of our successful trip to Sedona in 2016 , she planned another winter trip for us to Bryce Canyon National Park and surrounding Utah. This time we planned a few things differently. We boarded Maxx (the dog) because much of Bryce does not allow dogs nor do the local hotels. We also split the travel into two days with a stop in Las Vegas on the way to Utah and on the way back. Jamie also opted to bring our new Canon T7i as opposed to the G9X she brought to Sedona. The T7i is super lightweight and the new STM lens is also much lighter than other glass we own. This made hiking with it ideal. On February 17th we wanted to get an early start on our trip but I already had other plans. I went to The VOID at Downtown Disney and fought in an untethered physical world VR experience as resistance forces against the empire set in the Rogue One Star Wars era with my Dad and another family friend. As soon as I was done blasting storm troopers, Jamie, Silas and I hopped in our loaded Subaru and drove to Las Vegas to spend a night at the Main Street Station Casino and Brewery. On February 18th we walked over to the Hash House A Go Go at the Plaza Hotel and Casino. There are two of these restaurants in Las Vegas and if you can make it to either one, I highly recommend it. Get there early though as the lines start forming very quickly. Every breakfast item on the menu is special in some way and the portions are huge. 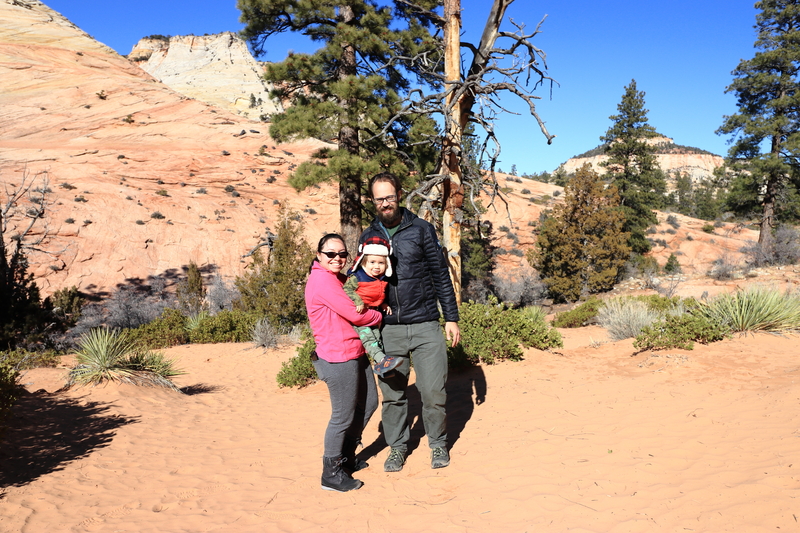 We left breakfast, checked out and immediately drove for Bryce via Zion National Park. The faster way is to go past Bryce on the 15 and come back down from the north but we couldn’t skip out on a chance to pass through Zion again. We spent some time at the visitor center and then drove up the switchbacks to the long tunnel which is lit only by natural light “Windows” cut into the rock. Once we made it to the other side of the tunnel, we found the first place with parking and took Silas out for a look around. We didn’t really hike as we needed to make it to Bryce so we drove on. Finally around 5PM we made it to the city of Bryce Canyon. We got dinner at Ruby’s Inn Cowboy’s Buffet and Steak Room, which would also be where we ate almost every meal while in Bryce. Then we checked in across the street at the Best Western Plus Bryce Canyon Grand Hotel. On February 19th we started exploring the park. 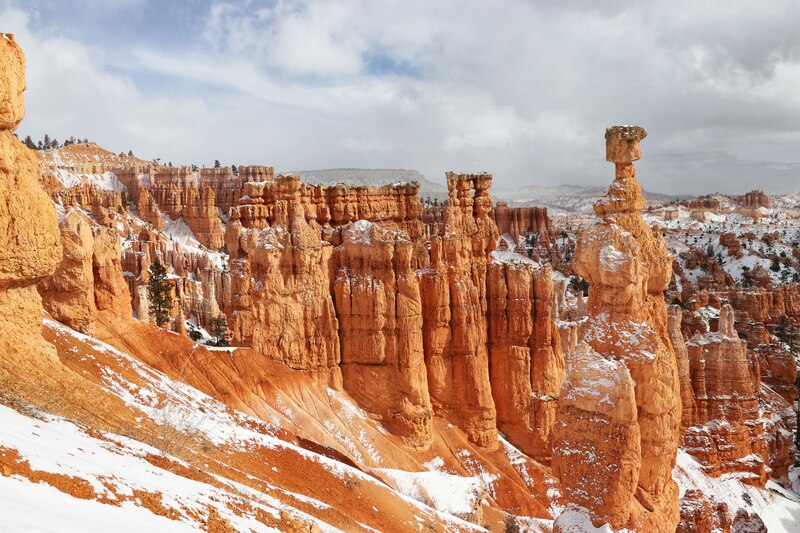 Because of the snow during the winter, everything past Bryce Point road was closed. We started by driving to Sunset Point and going on our first hike from there. We made sure to wear our Ice Trekkers traction devices on our shoes and I had my trekking poles replete with snow baskets. 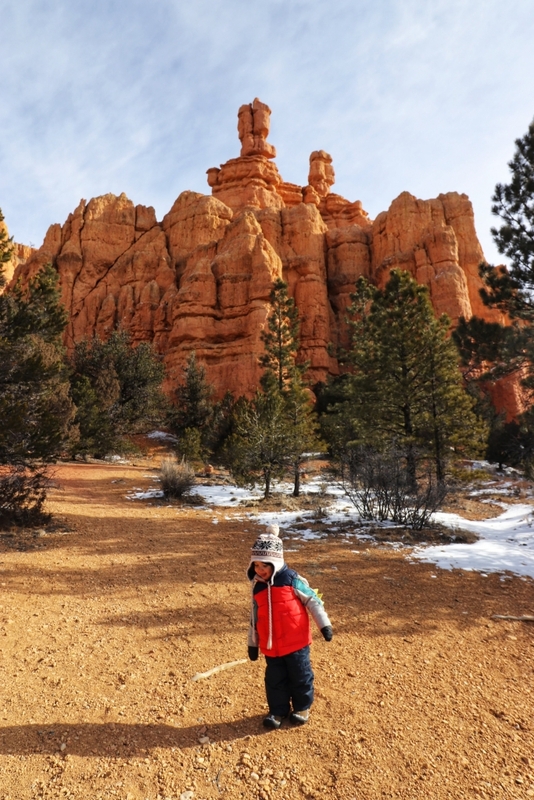 With Silas bundled up and in the backpack, we set off on Navajo loop trail past Thor’s Hammer. I wanted to go back via Wall Street but it is closed all winter due to potential rock fall so we took Queen’s Garden Loop trail to Rim Trail past Sunrise Point and back to the car. In total we hiked 2.6 miles and descended and gained 604 feet in elevation. Right around the Queen Victoria overlook, Silas began to get cold and uncomfortable so it’s good we didn’t try to hike a longer loop. One thing I learned from that day is the wind shear comes on abruptly in certain places in the canyon. After that day, we made sure to put the rain fly on the backpack which protected Silas from the wind better. After the hike, we drove to Bryce Point to take some photos from the overlook. Only one of us got out of the car at a time so Silas could warm up comfortably in his car seat. It had snowed the night before and the path to the overlook was icy. You could feel the wind was particularly strong from the exposed overlook. The wind caused any snow to ice over. I saw a couple of people have a very difficult time making it to the overlook because they didn’t hold the hand rail. On the way back to the hotel, we stopped at the visitor’s center. 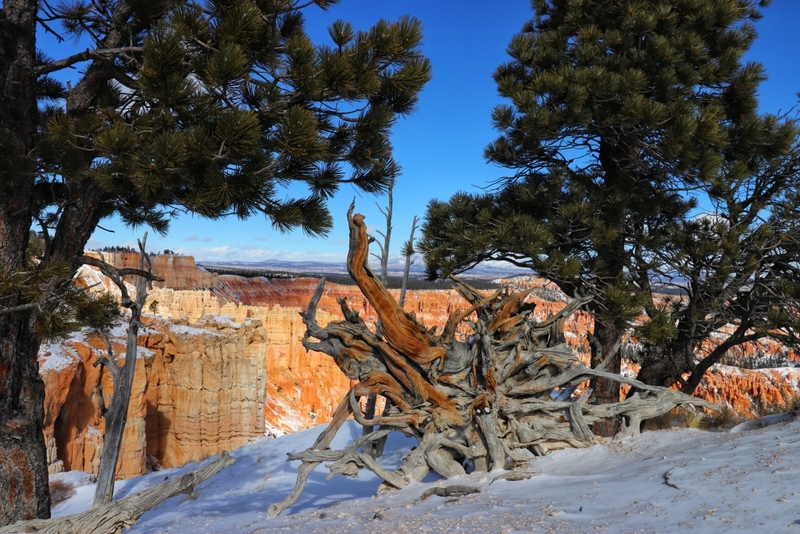 On February 20th we drove to Inspiration Point and hiked the Rim trail to Bryce Point. When we pulled into the parking lot to hike, the lot was not plowed and we could not see the parking spots. We just had to guess where the spots were. 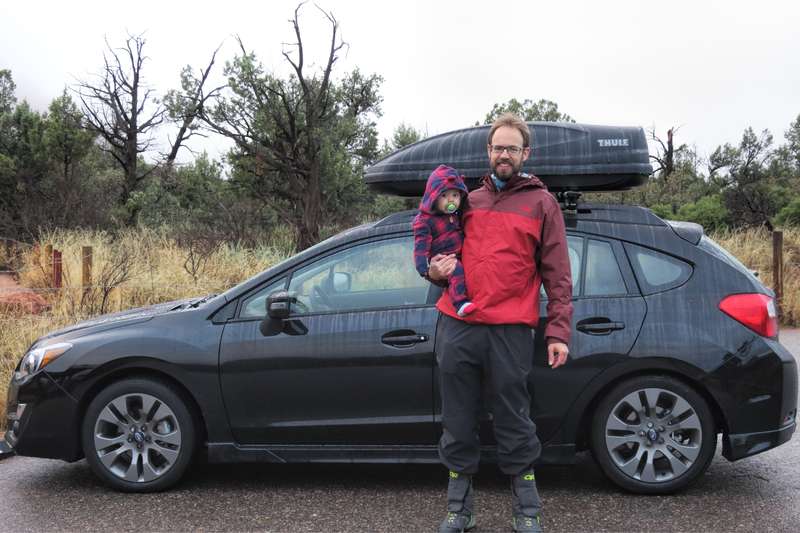 We put Silas in the backpack with the rain fly on this time and set off. Jamie took a lot of great photos on this hike. I tried to get a few photos in with my cell phone camera which requires much more understanding of the limitations of such an endeavor. The T7i just has a much better dynamic range, sharper lens and better sensitivity in the sensor. 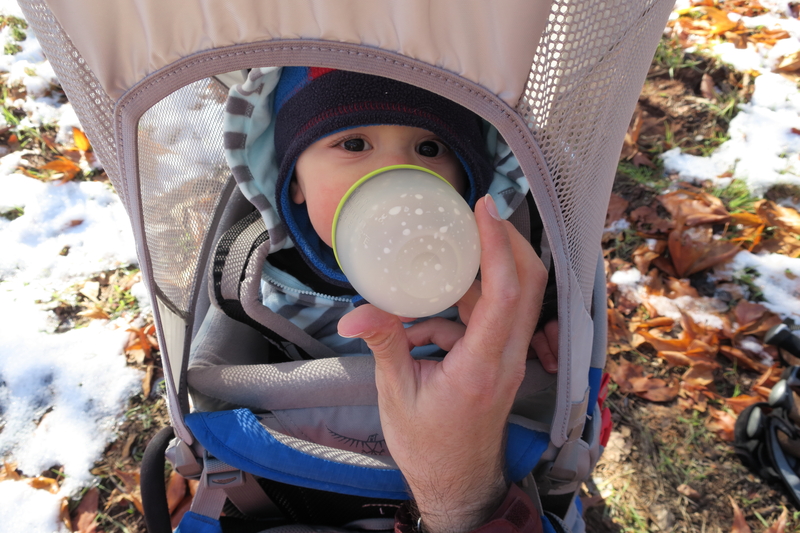 When we got to Bryce Point, we gave Silas a quick snack and set off back for the car. Silas started getting uncomfortable again towards the end of the hike but it was closer to the finish. We also hiked 3.2 miles and spent a little over 2 hours outside so all things considered, he did really well. 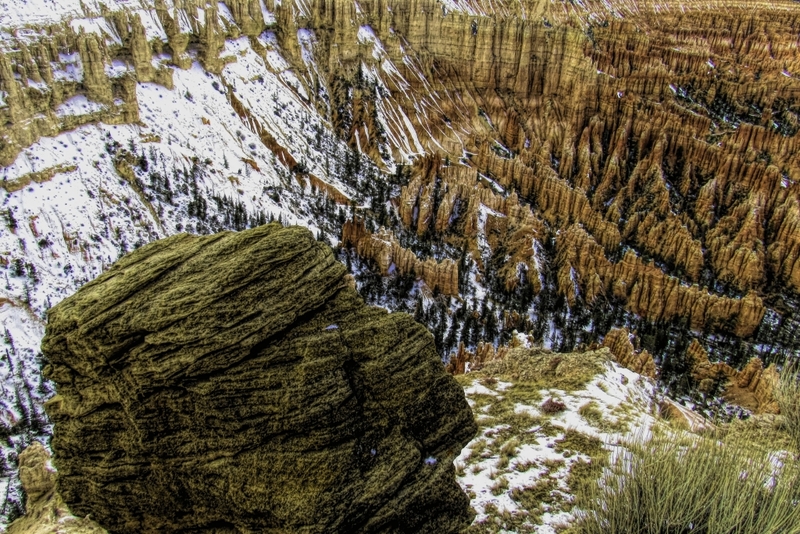 On February 21st we decided to venture to Red Canyon which is only a short drive from Bryce. We parked in the Red Canyon Visitor center parking lot. The visitor center itself was closed for the winter but the lot was plowed. Because the trails here were safe with no major drops or cliffs, we let Silas hike the first mile on his own while I carried the backpack for when he got tired. He did really well and even though it took an hour to go a mile, we had fun. Silas had waterproof shoes and pants so hiking in the snow didn’t bother him and he was actually warmer since he was moving. When he did get tired, we gave him a snack and put him in the backpack and hiked another 2.4 miles. The scenery here was better than expected. I recommend stopping here if you get a chance when you visit Bryce. There were many more trails in Red Canyon that we wanted to hike but we ran out of time on our trip to visit them. On February 22nd we packed up everything and set off for our travel day to Las Vegas. On the way we decided to take highway 12 through Panguitch to highway 143 which takes you up the back way to Brian Head. A note of caution is in order here. Fuel up, stock up on water and food and charge your cell phones because this road is only plowed during the day. I also don’t recommend this trip in the winter without all-wheel drive. As it was, the road was plowed and we didn’t run into any problems in the Impreza. 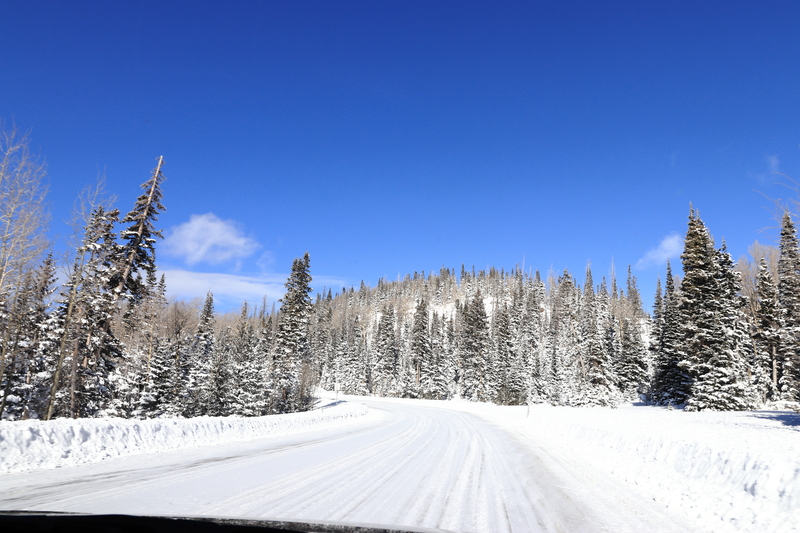 Normally you can take highway 148 to access Cedar Breaks National Monument but that road is unplowed and closed during the winter. We stopped momentarily at the snow bank where the road was closed and took some photos from afar. From there, we drove up to Brian Head. As we entered the city, we could see miles and miles of trails covered in several feet of fresh powder perfect for snowshoeing. We were just passing thru so we stopped at one of the many ski lodges that operate their own chair lifts and got some coffee and let Silas stretch his legs. 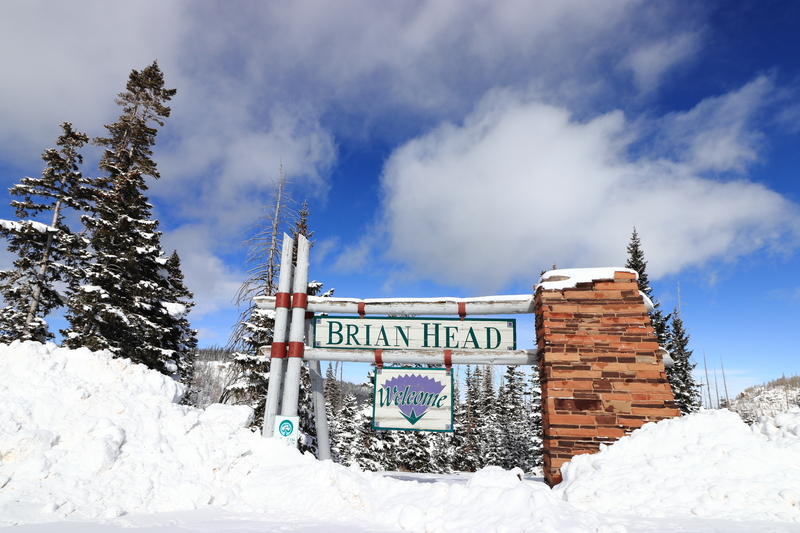 Passing through made me want to plan a future vacation with Brian Head as the destination. We drove another 200 miles and stopped at the Discovery Children’s Museum in Las Vegas. 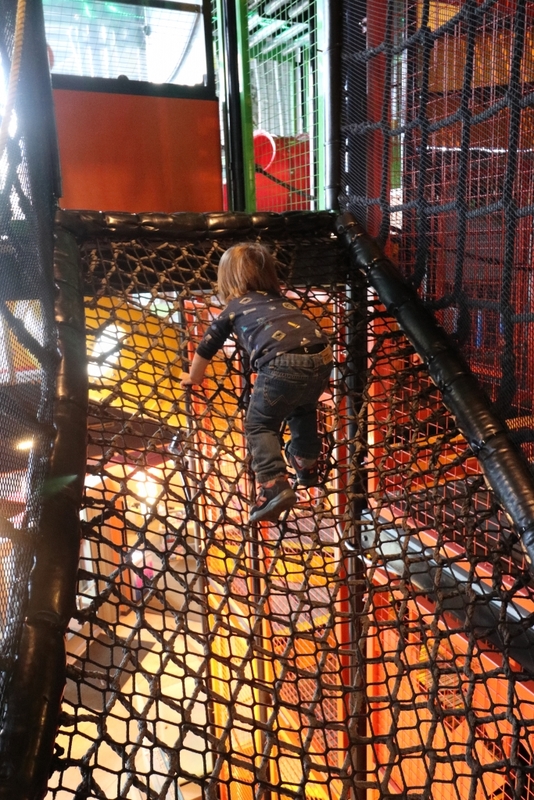 I highly recommend this place as it has activities for children of all ages. There are multiple floors of exhibits and interactions for children and adults alike to participate in an observe. Silas and I built competing Lego race cars and raced them down a customizable track. He also played with a water exhibit featuring water jets that ring bells, shooting water ramps that fire plastic balls into the air and all sorts of other fun stuff. We spent the night at the Golden Nugget and then drove the rest of the way home on the 23rd. All in, it was a successful and relaxing vacation. We had plenty of down time in between hikes and activities and saw many great sights. The weather was something we had to plan for but did not inhibit us really in the slightest. 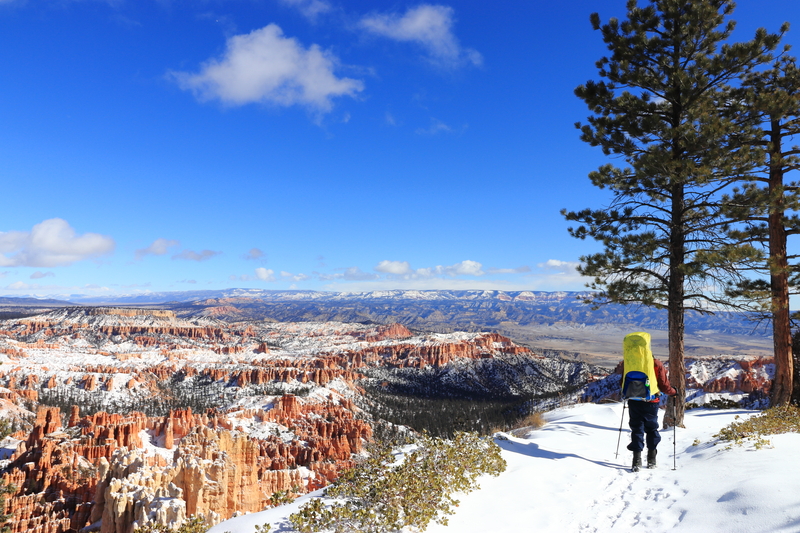 Preparing to dress in layers including a waterproof outer layer, having traction devices for our shoes, having an capable car and keeping a good mindset about the snow made the trip to Bryce and the surrounding area in the middle of winter enjoyable and one of the best trips I’ve been on. You can see many more photos in the Zenfolio Gallery. You can also buy prints from there to support ShezPhoto. The first 19 photos in the gallery were edited in Snapseed and are particularly great for prints. We have many of them printed on our own wall. Jamie, Maxx, Silas, and I took a hiking/photo trip to Sedona, Arizona during Christmas week 2016. The trip was an overall success but it took a lot of planning and being flexible with the weather as well as where we could go and not go with a baby and a dog. I had been wanting to photograph the desert covered in snow for a long time. I can probably trace this desire back to a time when Jamie and I stayed at Red Rock hotel outside of Las Vegas and there was a photo set on the hotel walls of the Red Rock Canyon State Park (the Nevada one) covered in snow. I liked the juxtaposition of a desert which usually conveys dry, hot, arid environments and the newly fallen snow which conveys the cold and wet. It was also transformational. I had been to the park only when it was bright and sunny out and the ground was dry. 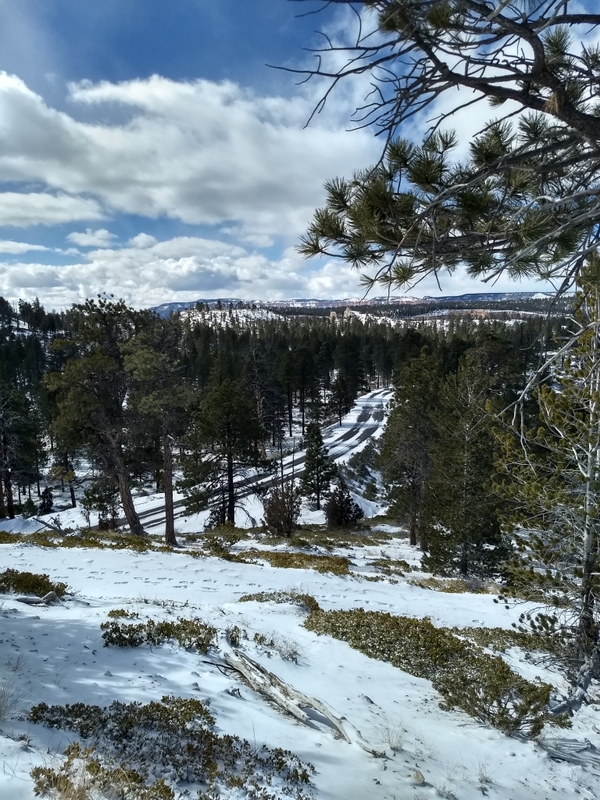 Seeing the whole scene coated in snow brought out a new landscape and changed usually dirt covered sections from a dull brown to a bright blueish white. The plants and trees that do live in the desert also took on new forms. 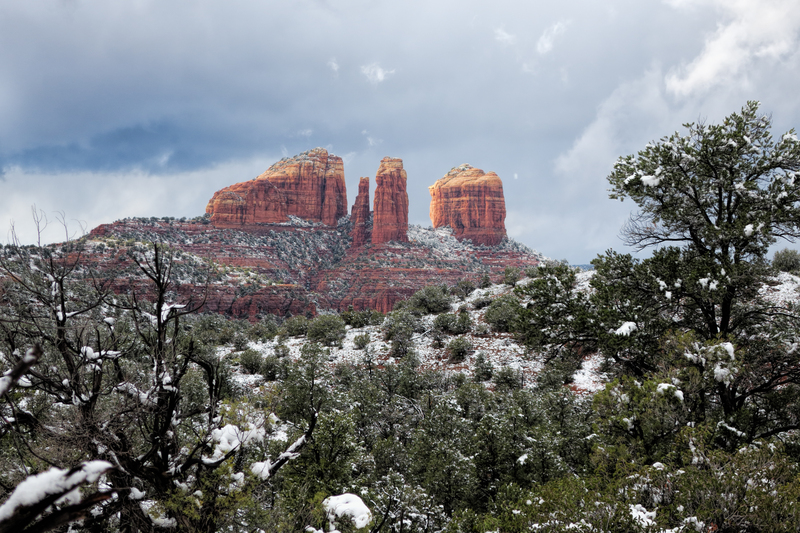 Since Jamie knew I wanted to photograph a snow covered desert, she planned a trip to Sedona in the winter. 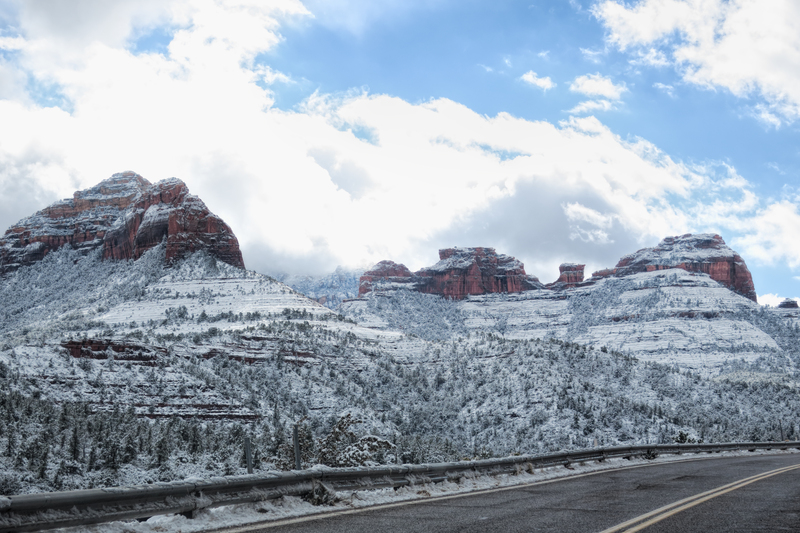 Sedona is beautiful all year round but in the winter even more so. 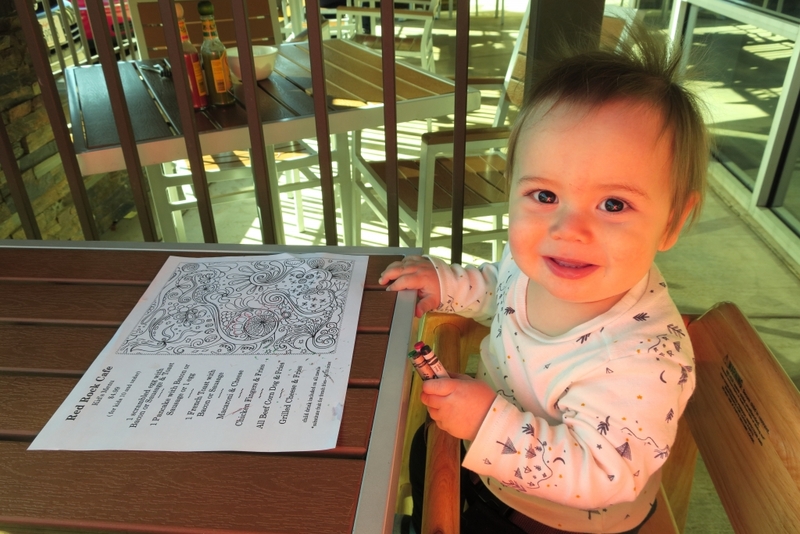 She had already wanted to go to Sedona so it was a win-win for us. The first challenge was to find an available place to stay that allowed dogs. We decided to book The Butterfly Garden Inn which is just north of Sedona on AZ 89A. They have some cabins which allow dogs and they have heat via a gas fired ben franklin stove. I worked the graveyard shift before the vacation so I actually slept during the day when I got off and started driving in the evening towards Arizona. 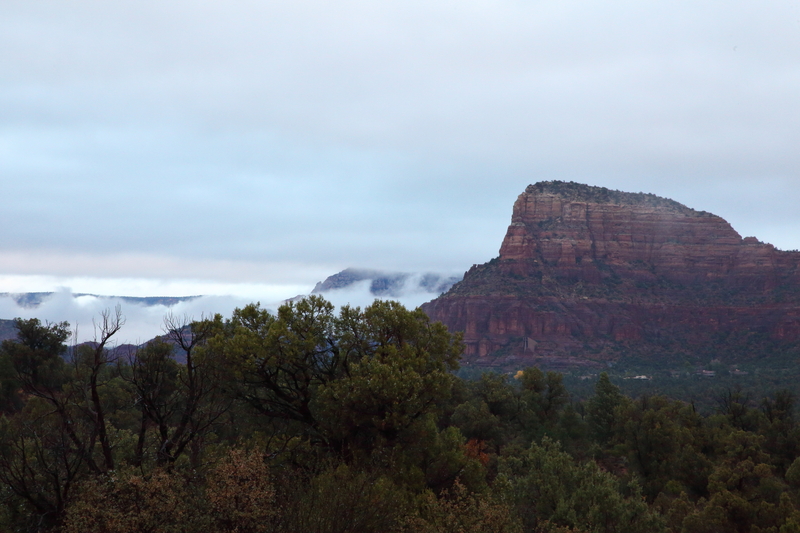 I drove all night and we arrived in Sedona just as the sun was coming up. The first place we stopped was the parking lot next to Bell Rock Bell Rock Access Trail, Sedona, AZ 86336. It had just stopped raining and the ground was slightly wet as we got out to stretch and walk Maxx. 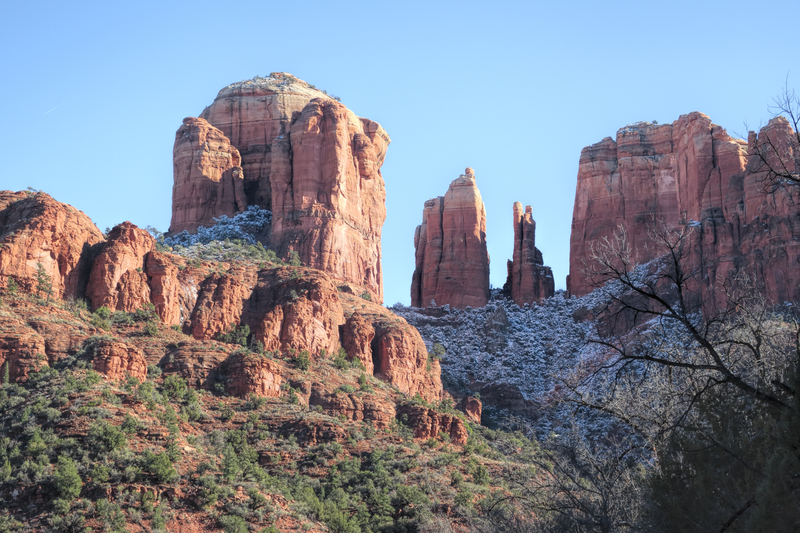 These photos show the typical Sedona landscape; Red rock outcroppings and formations and evergreen trees. A fog was setting in and it was a quiet morning. Silas wanted to get out and see Sedona. From there we set off to find breakfast at a restaurant where we could bring a baby and a dog. We ended up at The Secret Garden Café. They have a patio that is partially covered and allows dogs. It was still early but we wanted to find our cabin and get familiar with its surroundings. 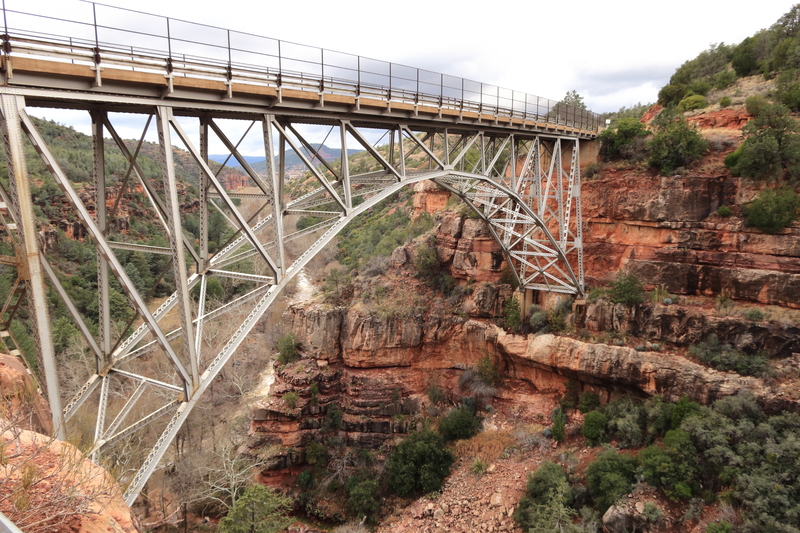 As we drove up Arizona State Route 89A we passed Midgley Bridge for the first time. We would end up coming back here several times. The bridge crosses Wilson Canyon where it intersects with Oak Creek and the parking lot serves as multiple trailheads. As we drove up further, we saw the swollen creek just full of water. We could tell that the water levels were above normal based on the amount of creek crossings that were impassable. Once we arrived at the Inn, we were assigned a cabin with a secluded entrance and plenty of space to park right near the door. We unloaded anything we didn’t need to keep in the car and set off for a quick hike. The first place we stopped was Bootlegger Picnic area but the trail that starts from there required a creek crossing so that was not possible. Next we stopped at Encinoso Picnic site. From here, I loaded Silas in the backpack, Jamie leashed up Maxx and we were off. Almost immediately, it began to lightly rain but not enough to cause us to turn back. Further up the trail however the trail got confusing. Different maps pointed to different cutoff locations for switchbacks up the mountain. No location was obvious from looking at the trail. 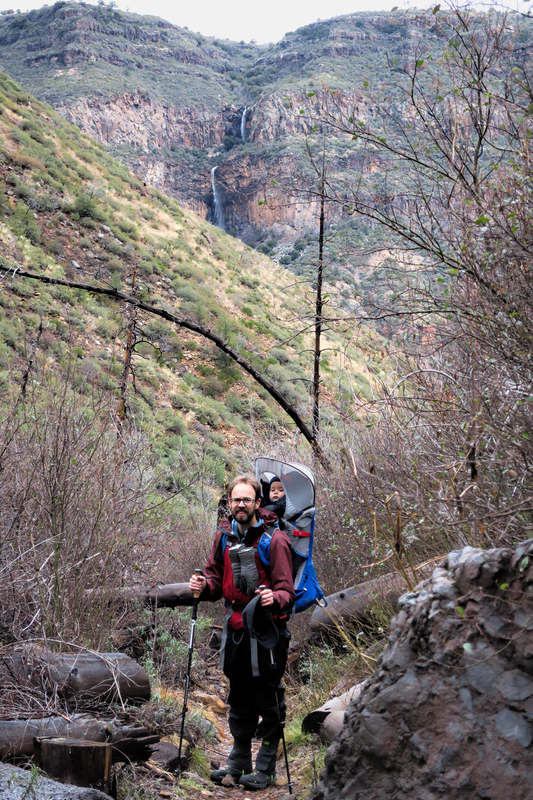 I wanted to push on as I had trekking poles and GPS so we would cross the trail eventually. Jamie however wanted to turn back so we bailed and went back to the car. It was an ok hike for the travel day and a good warm up to introduce us to the area. In all, we hiked just 1.9 miles. The next day was Christmas Eve. 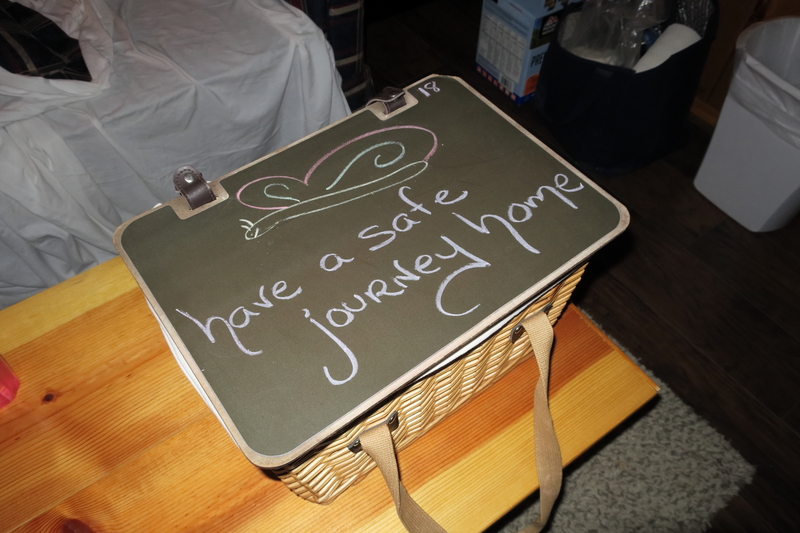 The Inn delivered breakfast to us in a basket left on a hook on the porch. We visited the Midgley Bridge Picnic area and then had lunch at the Wildflower Bread Company in town. That was the extent of our exploring because a storm was rolling in. 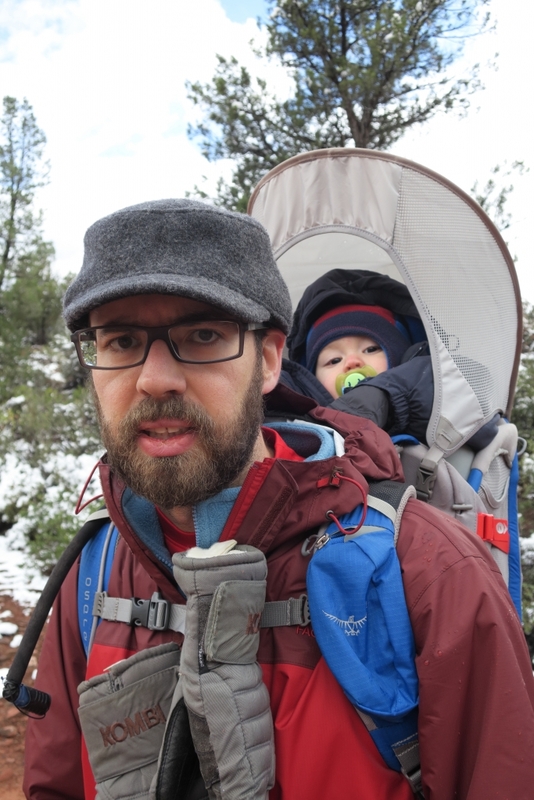 Maybe I would go on a hike without a baby but definitely not with a baby in tow. So we hunkered down and watched as the first few snowflakes fell; slowly at first and then turned into a full blown winter storm. When we woke up Christmas day, the ground was covered with at least a foot and a half of snow and the car had at least two inches of snow on it too. Fortunately, I had the foresight to purchase an ice scraper and that snow fell right off. 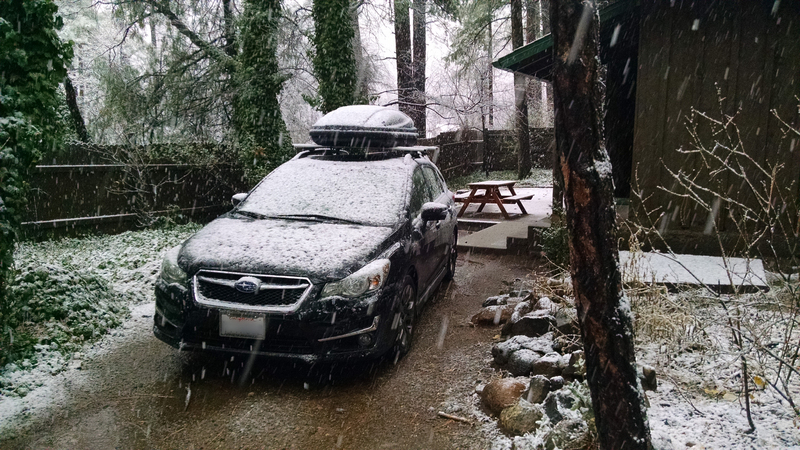 The Subaru has heated mirrors and windshield wipers so those were no trouble either. Once we gathered the courage, we piled in the car and set out. Our destination was the same one we stopped at on the way in; Bell Rock. The road was icy but fully plowed. The scenery however was completely changed. 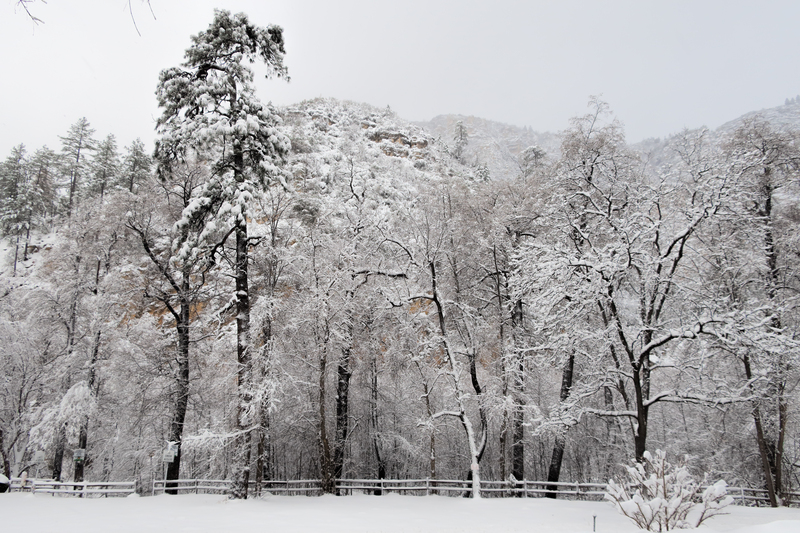 Up near the higher altitudes of our Inn, the Oak trees were completely covered in snow. This changed the landscape from one of dull browns and blues to one of shear white. The parking lot at Bell Rock was full so we moved to the adjacent one at Little Horse Trailhead. Down here, there was less snow but almost every rock or tree had at least some snow on it. 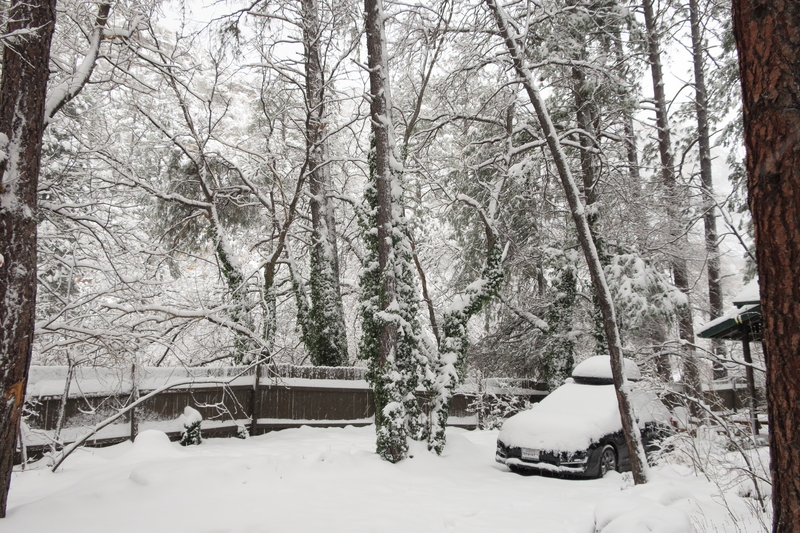 It was like nature decorated for Christmas just in time. The area around Bell Rock is decorated just in time for Christmas. Silas is sleeping of course. From here we linked up a half dozen trails and did a 5.9 mile hike over mostly flat or rolling terrain. It wasn’t too cold and Silas and Maxx both had a great time. 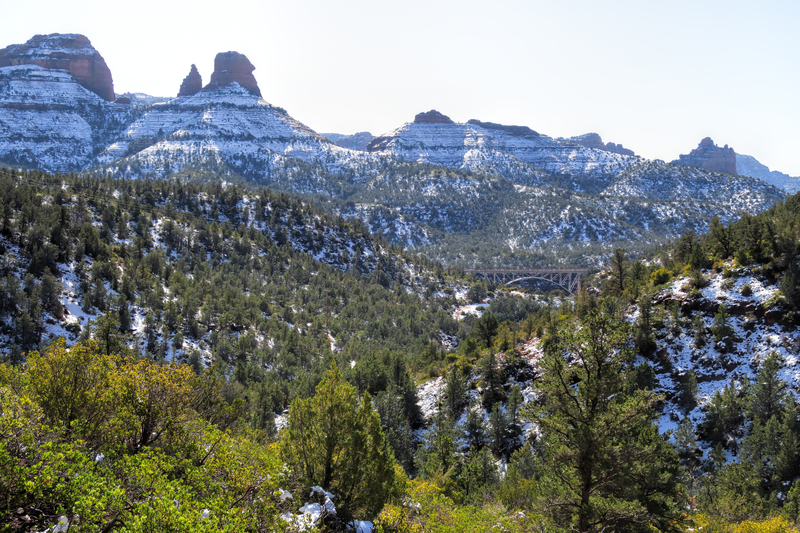 The path took us to Bell Rock, around Baby Bell, across the highway via a tunnel system, to a view of Cathedral Rock off in the distance, across the highway again by more tunnels, and back to the car. After the hike, we went straight back to the Inn. No restaurants were open on Christmas day so we hunkered down and played toys with Silas and consumed food we had stocked up on the days before. The power went out a couple of times but fortunately the gas powered stove kept us warm even without power. On the 26th, Jamie planned for us to visit the Red Rock State Park (the Arizona one this time). They don’t allow dogs so we had to day board Maxx at the local Bark N Purr Pet Care Center. So once we consumed breakfast at the Inn, we dropped off Maxx and proceeded to the State Park. They charge a small fee to park and from there you can park in one of many lots but we drove all the way in to the visitor’s center. It should be noted that the park sits in a little bit of a depression and because of this, there was almost no snow in the park. After we took a quick survey of the visitor’s center, we set off on a trail that would take us out of the park. We ended up hiking more outside the park than in it. The trail we connected with is Baldwin trail. It is a loop that took us right next to Cathedral Rock. Once we hiked back into the park, we took some additional trails and saw some of the old architecture within the park. People use to have a vacation house there before the land was donated. In total we hiked 6.7 miles. We visited the shop at the visitor center and bought some shirts and went to get some food at the Old Sedona Bar and Grill. Then we picked up Maxx and went back to the cabin at the Inn to rest up for our final day. 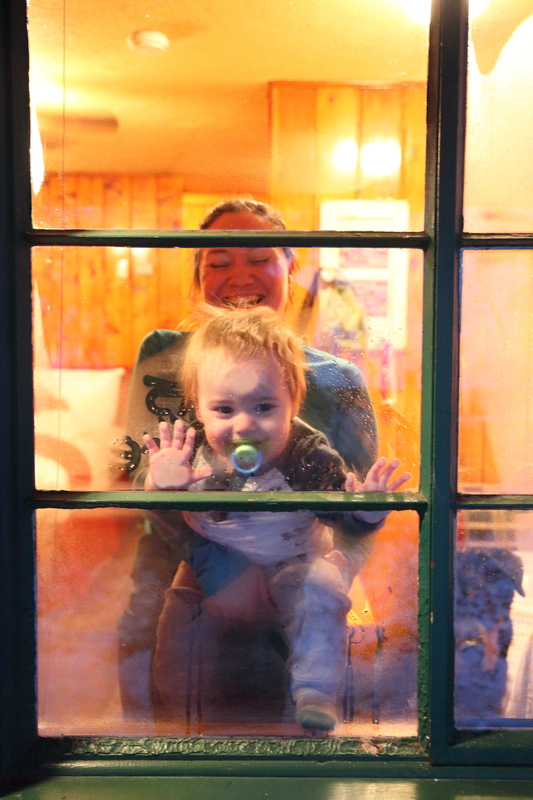 On the 27th, we packed up the car and said goodbye to our cozy cabin in the woods. We went to Midgley bridge which was packed now due to so many people wanting to photograph from there. We got some photos and decided to take a final hike from there. We hiked up Wilson Canyon which Connected with Wilson Mountain trail (the same one we started from the other side of the mountain our first day). Then we had a decision to make. We could go up the mountain but Jamie wasn’t keen on that idea. We could go down the mountain, or we could take a spur that should loop around. We took the spur only to soon realize it was not well traveled and the only prints in the snow were from deer. At some point even though GPS said we were right on the trail, only bushes were in front of us. Faced with trampling through bushes with a baby on my back or turning around, we decided to turn around. We took the spur back to the junction and then went down Wilson Mountain trail towards Midgley Bridge. 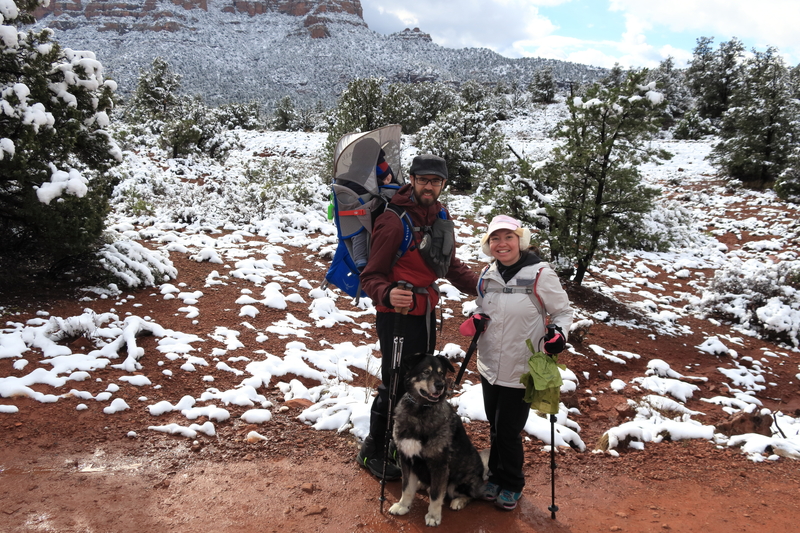 And that’s the story about how we lost the trail in the snow with dog and baby in tow. In all, we hiked 3.9 miles. On the way out of town, we stopped at Red Rock Café and grabbed a bite to eat. They had only one table that you could sit at with a dog so we took that one. We all loaded up on carb heavy breakfast type food to recover from the only moderately strenuous hike. Then we piled in the car and made the much too long drive all the way back home in Orange County California. You can see many more photos at the Gallery and remember you can support Shez Photo by purchasing prints and other products from there as well. 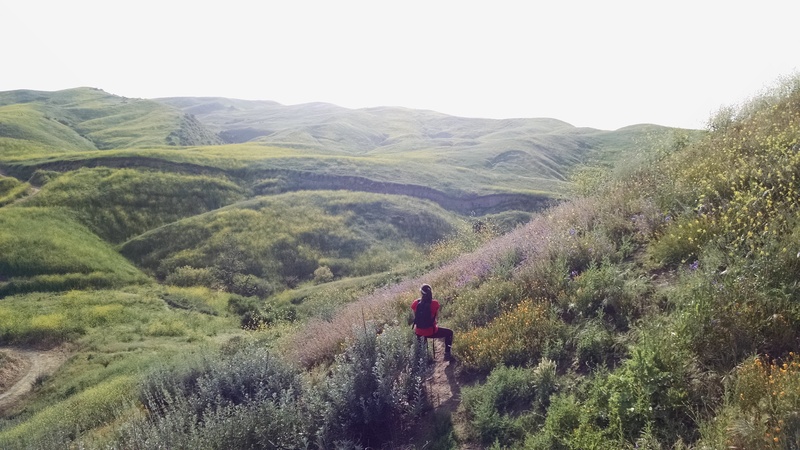 This past weekend, we hiked in on the upper Aliso Canyon trail in Chino Hills State Park in search for wildflowers. The plan was to hike about a mile in and a mile out but that soon turned into more than double that before we came across any wildflowers. The park is overgrown with invasive mustard plants. Their yellow color is still pleasant but it’s literally everywhere you look. Finally we found some poppies and other wildflowers up on a hill. Jamie was carrying the Canon EOS M5 while I had the SX530 however up on that hill, all I had access to was my cell phone. This is the photo I captured of Jamie hard at work photographing the flowers close up. 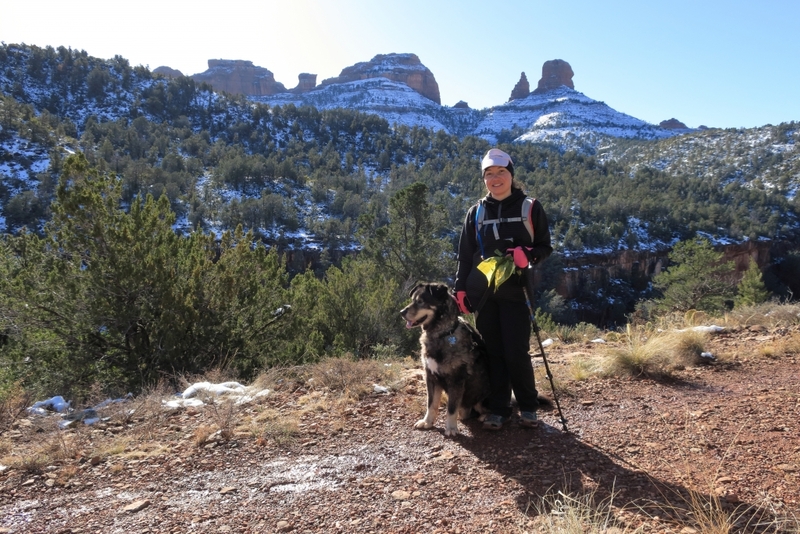 Jamie, Silas, Maxx, and I visited Sedona, Arizona during the week of Christmas in 2016. On the way up it was raining but that storm soon cleared and another colder storm brought almost a foot of snow. One of the days while driving back to town from our cabin at the Butterfly Inn, Jamie snapped this photo. She took the photo from the moving car using a Canon G9x. 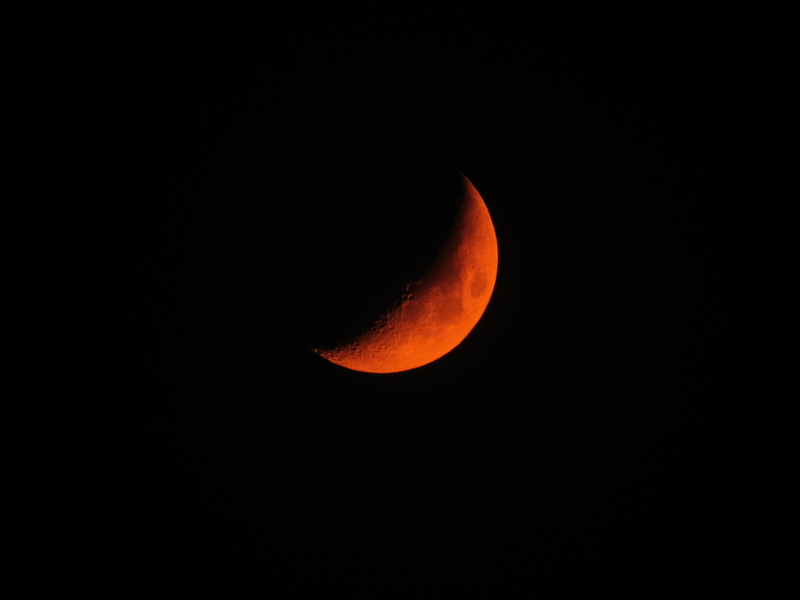 Jamie shot the photo at F/5 1/1000 second and ISO 125.